Experience in this area reveals one key distinction which separates cases where restraints are successfully upheld and those where compromise outcomes are achieved.In successful cases, typically, the restraint provision has been drafted neatly around the key protectable interests. 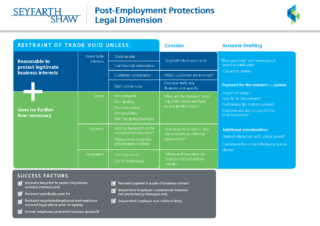 When seeking to enforce a restraint, an employer will be required to show there is a protectable interest capable of supporting the restraint. This is the first limb of the test for enforceability. The scope, duration and geographical operation of the restraint are logically tied to the protectable interest (see our map below). An employer will need to make out each of these elements to meet the second limb of the test.